Kids and candy are a natural combination--what child doesn't love a sweet treat now and then? These kid-friendly candy recipes are easy, fast, and don't require complicated tools or hot temperatures, making them perfect for little helpers! These simple and safe kid-friendly recipes are a great way to introduce children to the joys of candy making, and everyone in the family will love eating the final product! 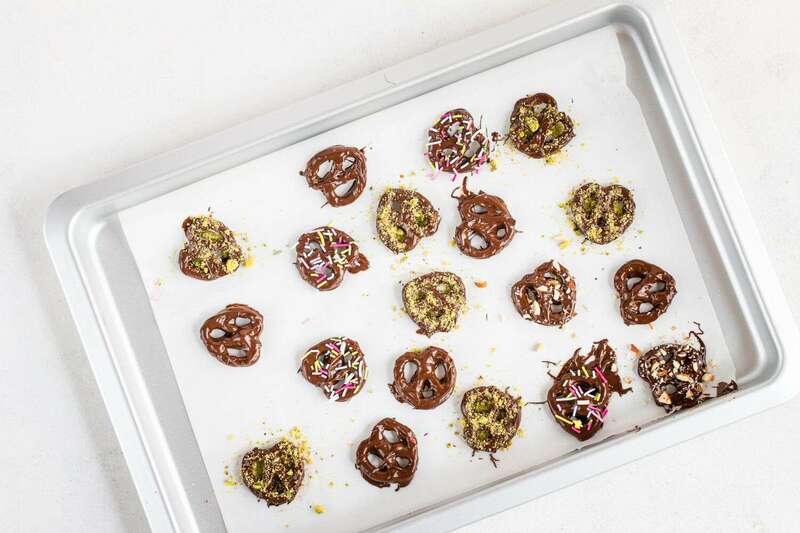 Chocolate-Dipped Pretzels are easy to make, and the combination of sweet chocolate and salty, crunchy pretzels is fantastic. Let kids choose the toppings and go to town adding sprinkles, nuts, coconut, or whatever else you can think of! These classic Rocky Road drop candies feature dark chocolate, chewy marshmallows and toasted nuts. You can experiment with adding different nuts, chunks of white chocolate, or dried fruit to the mix. This recipe for oreo truffles calls for only three ingredients. Kids can help roll the balls and dip the candies, and they’ll like the familiar taste of oreos in cookie form. This candy pizza recipe is easy and fun for kids to make, and tastes as great as it looks! Chocolate is mixed with mini marshmallows and crispy cereal to form a chewy, crunchy, chocolatey crust, and is topped with candied fruit or candies, coconut, and drizzles of white chocolate. Turtle Candies get their name from their whimsical turtle shape. The combination of toasted pecans, soft caramel and smooth chocolate is impossible to resist. Kids will go ape for these Monkey Caramel Apples! Caramel apples are coated with chocolate and decorated with cookies to resemble cute, playful monkeys. Kids will love to help make these, and they're perfect for birthdays or animal-themed parties. Rock candy is a simple sugar candy that can double as a science experiment. The process can take up to a week, but it’s fun to watch the sugar crystals growing over time. S'mores Pops combine three classic S'mores tastes—marshmallow, chocolate, and graham—into one delcious package. Try mixing it up by using cinnamon or chocolate graham crackers, or using a different kind of chocolate. These are great for bringing to picnics or campouts! Young helpers will enjoy shaping the potatoes; and rolling them in the cinnamon mixture. These candies don't contain actual potatoes, but they do feature an unusual but delicious cinnamon-coconut combination. Who knew two simple ingredients could be so good together? Toasted chocolate and coconut are a match made in heaven in this quick and easy drop candy. You can experiment by substituting raisins or slivered almonds for a portion of the coconut.